Home/News and Events/Florida’s most valuable treasure map? This is a bathymetry map of The Elbow, a popular fish hangout, that was collected by the USF College of Marine Science (USFCMS) team. The Elbow area has a prominent north-south ridge feature that sits more than 115 miles west of Tampa Bay in nearly 180 feet of water. The red color indicates the top of ridge in the Elbow reaches nearly 25 feet above the surrounding seafloor – about the height of a typical telephone pole. ST. PETERSBURG, FL – There is a map for everything these days, and, it seems, fewer and fewer secrets. You can easily zoom in on a bush in your backyard, see the planes flying above at any given second, or find the best place to get New York-style bagels in your neighborhood. But here in Florida there’s a gargantuan map – one that is 15 percent larger than the state of Florida itself – that is nearly empty despite its critical role in the state’s economy, culture, and future. This map remains chock full of secrets despite a valiant effort in recent years to fill in the data. “It’s crazy that we haven’t done this yet,” said Dr. Steve Murawski, Professor at the USF College of Marine Science. 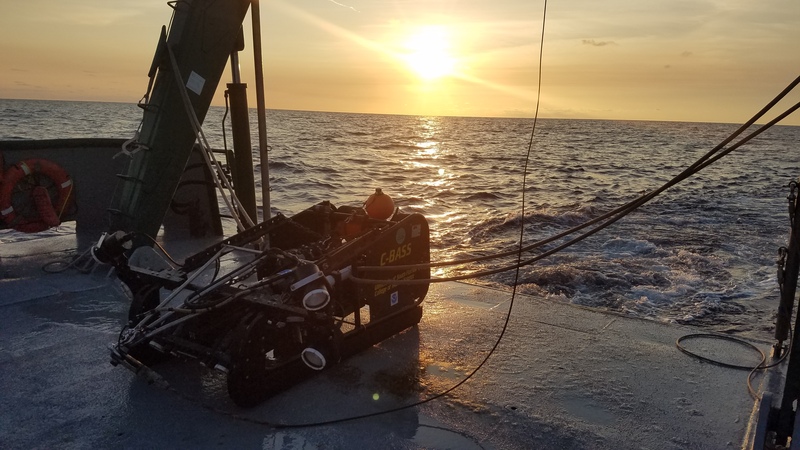 Murawski is helping to lead the most ambitious and comprehensive effort to date to develop a map of the seafloor that stretches from the west Florida coastline into the belly of the Gulf of Mexico. The goal is to identify the fish “neighborhoods” along the West Florida Shelf, which starts about 20 miles off the coast of St. Petersburg in waters that deepen from 60 to 600 feet deep. Some maps still in use today date back to the 18th century. The Continental Shelf Characterization, Assessment, and Mapping Project – C-SCAMP for short – started in 2015 and will wrap up this year. By the end, Murawski’s team will have mapped a total area larger than Jacksonville, the largest city in Florida, doubling the areas mapped to date from three to 6 percent. This builds off of USGS’s previous efforts as well as those led by USFCMS professor Dr. David Naar and his team who mapped several areas on the West Florida Shelf between 1999 – 2006. But the west Florida shelf is a whopping 77,000 square miles. “It’s just a huge area to cover,” said Murawski, whose team has submitted a legislative budget request as part of a larger proposal for a Joint Institute for Gulf of Mexico Studies at USF, so they can continue the quest toward full coverage. Aside from the vastness of the space, mapping the seafloor beneath several hundred feet of saltwater is tough business – but a priceless treasure to local fisherman, resource managers, and scientists. It empowers them not only to determine where the prized grouper, red snapper, and golden tilefish live but where endangered loggerhead turtles hang out, where the most sensitive marine habitats or safest shipping routes are, where we should source sand for beach renourishment projects, and more. “Our knowledge of the baseline – what’s normal for the Gulf, and what isn’t — was severely lacking at the time of the oil spill,” said scientists Sarah Grasty, who serves as C-SCAMP’s project manager and has been onboard since its inception. The historic Deepwater Horizon oil spill occurred nine years ago as of April 20, 2019, and the opportunity to map the shelf, funded by the National Fish and Wildlife Foundation, came in response to the spill. “It’s a growing project, and it’s got wings now,” said scientist Chad Lembke, who leads the project with Murawski and marine geologist Dr. Stan Locker. In addition to the USF team, collaborators include scientists from the Florida Institute of Oceanography, Florida Fish and Wildlife Conservation Commission, and the National Oceanic and Atmospheric Administration (NOAA). The latter two groups are largely responsible for collecting the data used in the reef fish stock assessments for the Gulf of Mexico and have generated maps of the seafloor to the extent that their resources have allowed – but this team hopes that they can help produce something more comprehensive. The USFCMS team has mapped several sections of the west Florida shelf – a total area larger than Jacksonville, the largest city in Florida – doubling the areas mapped to date from three to 6 percent. There’s a lot left to map and understand, especially as pressure from the oil and gas industry looms. Scientists and fishing captains have known for eons that fish in the Gulf like red snapper enjoy the structure and refuge provided by so-called “hard-bottom habitats” as opposed to the gentle, snoozy sand swaths that characterize most of the west Florida shelf. Hard-bottom habitats in the Gulf include structures such as old oyster beds, limestone outcrops, rubbly gravel, ancient reefs, and artificial habitat like shipwrecks or human-made reefs. But if this project is the salty version of a city census, we really only know about relatively few neighborhoods in the Gulf where fish take up residence. Not only is the scale of the area to be surveyed daunting but the work requires patience, too, Grasty said. Some pockets of hard bottom relief the team has discovered, for example, are about the size of a typical desk and covered with a thin veneer of sand. “There’s just always more to do and more people power needed to do it,” she said. Assembling the cross-disciplinary C-SCAMP team and establishing the protocols for this mapping and fish-finding feat in the first place was not easy but now it’s like a well-oiled machine, Grasty said. Mapping the seafloor requires a research ship to “mow the lawn” as marine scientists like to say. It requires a ship to go up and down and up and down the target area in tightly spaced lines at a speed of about six knots — about double the average walking speed. It’s not fast work. 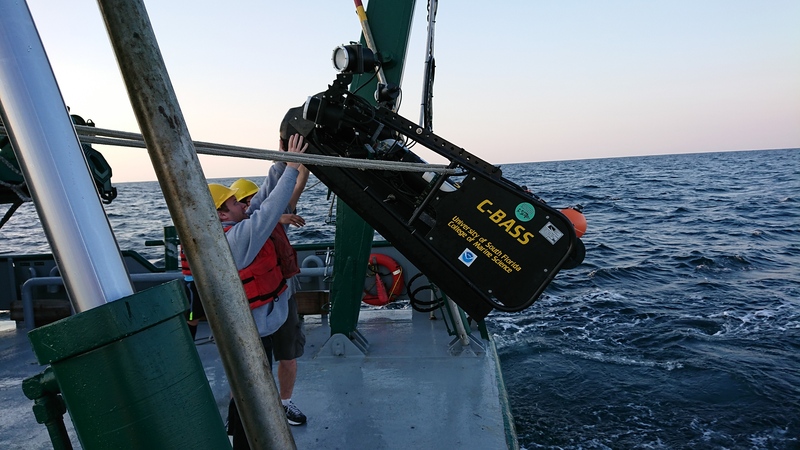 The team uses a multibeam echosounder that emits sound waves and then “listens” for these emissions to return back to the instrument after bouncing off the seafloor. This allows them to generate maps that show two primary kinds of data: bathymetry and backscatter. Bathymetry is the topography of the seafloor; it identifies any lumps, bumps, and straightaways along the seafloor. Backscatter records the strength of the sound signal that bounces off the seafloor back to the ship; it helps scientists identify whether the seafloor beneath the ship is made of sand or rock. Based on the habitat they detect, the team can make a decent guess as to which fish are living there. But the C-SCAMP team doesn’t stop there. To be sure their hunches are correct they use a towed camera system called the Camera-Based Assessment Survey System — or C-BASS for short — to do a visual survey of the areas mapped. The C-BASS helps them estimate population size as well, and is armed with sensors that measure water temperature, depth, salinity and other variables such as water clarity. To use it, scientists have to slow the ship speed down even more than they do for the mapping work. The team is paving the way for this kind of seafloor exploration and continues to experiment with new ways to count fish. One innovation smacks of a new kind of seafloor CSI. They are working with independent nonprofit research institute SRI International to use artificial intelligence to develop the fishy version of facial recognition software. SRI first developed the Siri personal assistant feature of the iphone. Identifying fish in this way would save significant time (and eye strength) usually spent by graduate students and staff members poring through reams of fuzzy black and white video footage. There are bugs to be worked out but “there’s no doubt this would be revolutionary for fisheries management efforts worldwide,” Grasty said. Over the course of C-SCAMP’s 12 research cruises to date, the team has mapped in and around a handful of areas of the west Florida shelf known to be popular fish hangouts called The Elbow, the Florida Middle Grounds, Steamboat Lumps, and more. These areas are loaded with a spectrum of high-bottom relief such as old structures that provide a safe spot for fish to spawn and hide from predators. They’ve also confirmed that while Florida and its legendary carbonate shoreline is long and flatter than flat, the deeper waters of the shelf are sprinkled with old shoreline ridges, sinkhole structures, isolated reef mounds and pinnacles, spits that reach about 30 feet from the seafloor, and more. “It is amazing that past shorelines were drowned in place and preserved as sea-level came up since the last glacial period across the west Florida continental shelf. There is still so much to discover offshore,” said Locker. Next on their mapping list – and last on the list for the current funding round – is an area much further south than previous study areas, far off the coast of Naples. “We didn’t just want to go to those neighborhoods that already have lamp-posts,” said Murawski. The places visited by the team to date are already known fish habitats, if poorly mapped and sampled ones. “The pipeline is a habitat oasis in the desert,” Murawski said. It’s loaded with sponges, corals, and gobs of fish. It also seems to be popular with sea turtles that use it as a kind of highway or rest stop year-round. “What the turtles are doing here is still a looming question,” said C-SCAMP’s resident turtle expert, Dr. Heather Broadbent. Of the 78 Kemp’s Ridley and Loggerhead sea turtles she observed over a two-year period, 70 of them were found along the pipeline. “There’s so little habitat on the west Florida shelf that this pipeline is a really interesting laboratory,” she said. 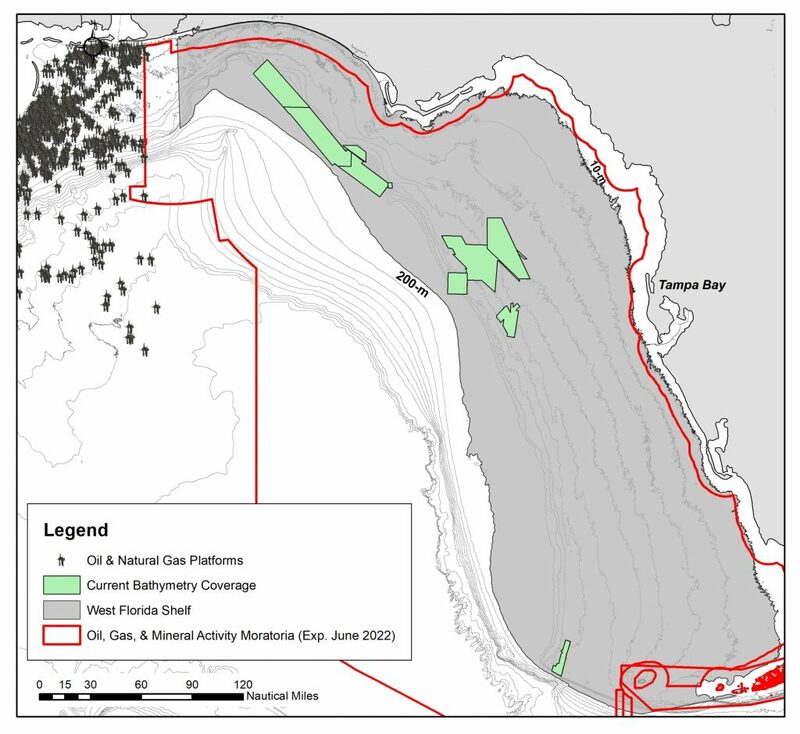 Currently the west Florida shelf is legally closed to drilling for oil and gas but the pressure looms. The moratorium, in place until 2022, is subject to change. “It’s critical that we fully understand this habitat before anyone starts trying to modify the boundary of the moratorium. The oil companies are butting right up against the boundary line already,” said Murawski. He explained how lucky Florida was that the Deepwater Horizon oil spill did not get caught up in the Loop Current. The Loop Current is the large, strong current that flows north into the Gulf of Mexico nearly touching the Panhandle at times, “loops” down along the west Florida shelf, and exits via the Florida Straights where it joins the Gulf Stream that moves northward along the east coast of the United States. It’s possible this current could present a safety challenge for any newly established oil wells positioned further east in the Gulf, Murawski said. Armed with their maps the team hopes to at least guide those drilling activities to the least sensitive marine habitats, said Lembke. “Even sending them a few miles east or west of a known habitat hotspot can make a big difference,” he said. 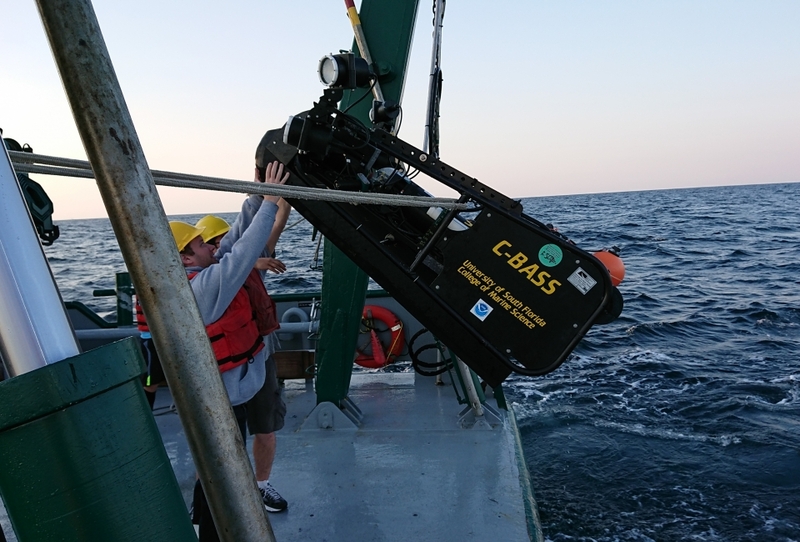 The USFCMS team deploys C-BASS, a tethered camera system that is lowered and towed near the seafloor at a speed of approximately 4.5 miles per hour. The M/V Holstein was a freighter that sank in a storm in 1992 near the Florida Middle Grounds, a series of ridges and popular fish hangout more than 100 miles northwest of Tampa Bay. 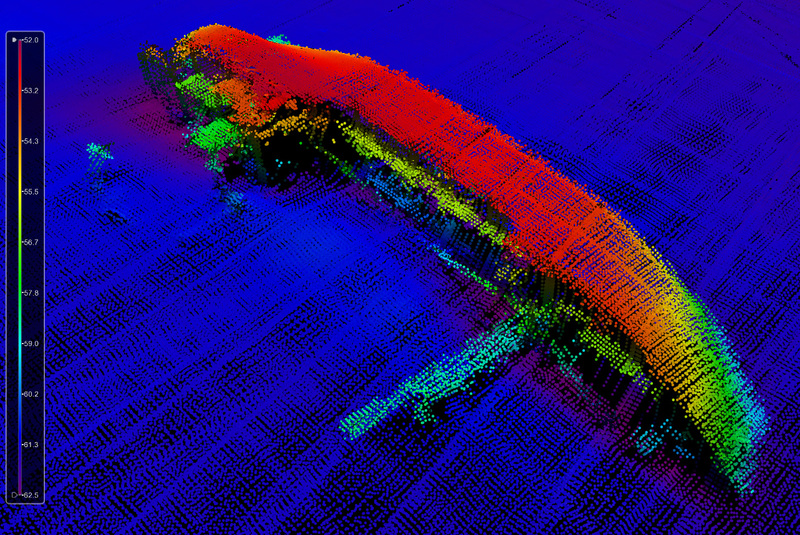 It had 2000 tons of corn flour onboard and is known as the “flour wreck.” This image shows a 3D map of the wreck; the red dots indicate the top of the ship sits about 170 feet off the bottom. 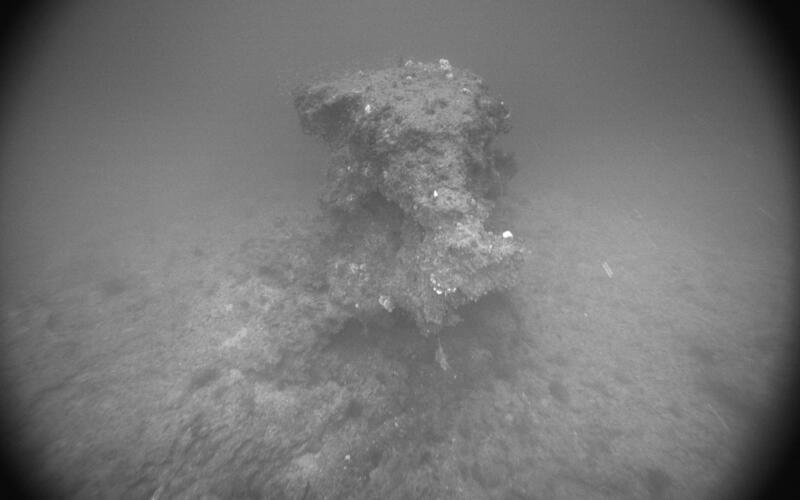 Most of the West Florida Shelf is a gentle sandy slope but here and there scientists find hard-bottom habitats such as old oyster beds, limestone outcrops, rubbly gravel, ancient reefs, and artificial habitat like shipwrecks. This structure off the coast of the Panhandle is at least 15 feet tall. The team uses its Camera-Based Assessment Survey System (C-BASS) to do a visual survey of the areas mapped. The C-BASS helps them estimate the fish population sizes in a given area, and it has sensors that measure water temperature, depth, salinity and other variables such as water clarity. 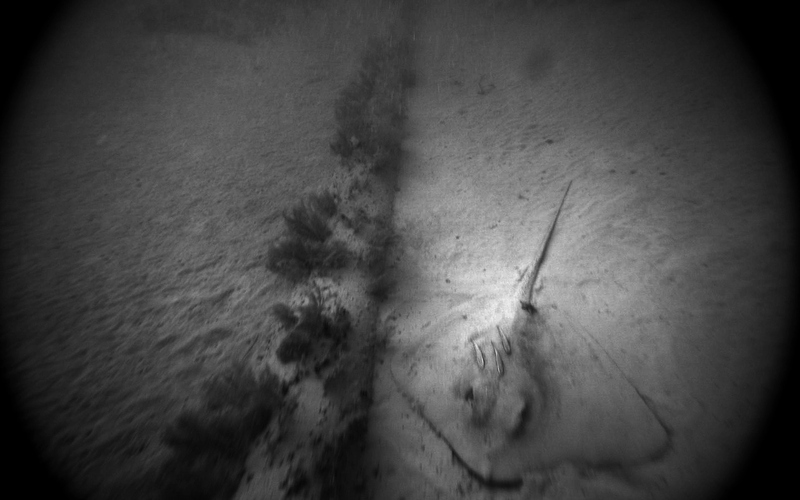 The Gulf Stream natural gas pipeline is about 3 feet wide, which means this Southern Stingray nestled alongside it has about a 6-foot wingspan. 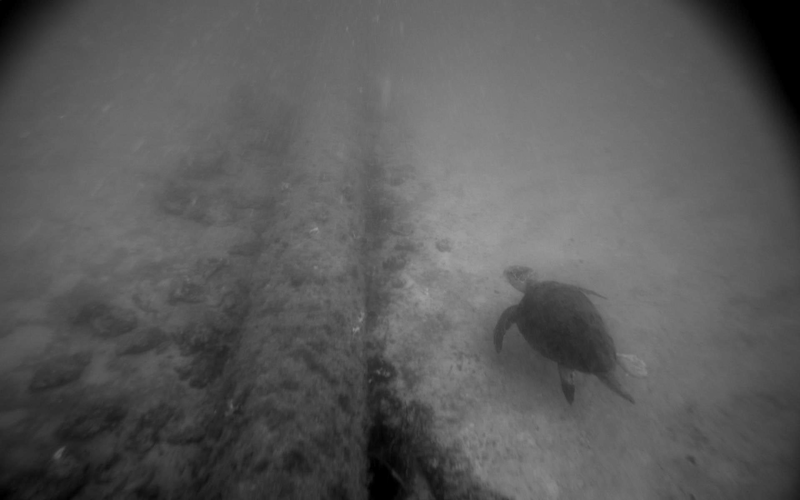 A Loggerhead Sea Turtle swims by the Gulf Stream natural gas pipeline that extends from Mobile, Alabama to Tampa, Florida – akin to a marine life oasis in the desert. There are several sunken treasures off the Florida Gulf coast, including WWII tanks, an old barge, and concrete pieces of old bridges that were sunk several miles off St. Petersburg Beach. You can see these structures in this video sequence. The top left square shows bathymetry, which indicates the topography of the seafloor. The bottom left square shows vertical relief of the structures surveyed, and the right panel shows backscatter that indicates whether the seafloor is made of sand or rock.